With this new updated version of the extremely popular Cleanse and Purify Thyself, Dr. Richard Anderson shows clearly and scientifically the awesome power of cleansing to rejuventate health rapidly and remarkably. Stimulating, shocking and very educational, Book One is full of truths never before presented in book form. Most people read it fascinated, absorbing infromation like a dry sponge absorbs water. This book was lent to me, at a time when I am actively researching answers to optimal health. I gave this book a very good rating, even though there are few things I don't completely agree with. Since I am very open minded, I enjoy reading many books, and comparing to see which ones seem to make sense, and resonate with me. I have long known about the perils of treating "symptoms" as though they were a disease. Dis-ease is the end result of a cause, and symptoms are nature's warning signs, much like the oil or engine light in a car. Does one unscrew the bulb because they are tired of looking at the light? Every cause has an effect, and many times the effect shows up many years later. Based on what I know about Wellness, Dr. Anderson has done his homework. There is a great deal of critically important information here. The book is very frank, and is a "wake up" call to better health. Some parts will even bring a chuckle or two. It is not for the closed minded however, and/or, those who think there is nothing they can do about their challenges, and/or continue to rely on others to take control of [destroy?] their health. Is this book perfect? No, I don't believe any one source [human] can be perfect, as there are simply too many variables. The Creator is the only one who knows all. The religious references offer an interesting perspective, and will prompt one to do some investigating. His views on meat eating vs vegetarianism will do the same. Personally, I know that being a strict vegetarian did not work for me. The best parts of the book are the lengthy chapters on how our body is designed to work, and how what we put into it affects that process. In my opinion, if more people had a better understanding of basic anatomy, vs the desire to eat for taste, appearance, and advertised food trends, we would be empowered to make better decisions, and be in much better health. I intend to begin the cleanse on May 5, 2003, and I am looking forward to the results. As a leader in natural medicine research and writing, Dr. Richard Anderson holds a special place in the alternative health world. With his first Book, Cleanse and Purify Thyself, he awoke tens of thousands of people to the physical and spiritual benefits of internal cleansing. He has developed one of the most profound internal cleansing systems ever made known and available to the public. 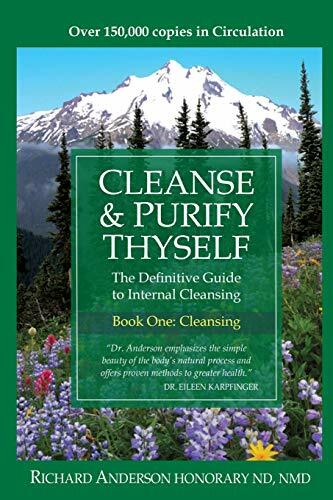 Through extensive research, Dr. Anderson has expanded his Cleanse and Purify Thyself series to the exceptional offering of spiritual inspiration and science that it is today. Dr. Anderson continues to devote himself to research, writing, lectures and spreading his message of health and love.